It’s a shame that the only way college basketball can attract the attention of some casual fans is by cramming all kinds of events and challenges in the early season that pit top teams against each other in all sorts of ways. It’s like a toddler who begins to make rash decisions for attention after his parents give birth to a new baby sibling. For the diehard college basketball fan, it can feel a little silly making the best teams play at military bases, tropical resorts, and in forced matchups as part of league-wide challenges. At the same time, there’s a ton of great games in November and I’d be crazy to complain about it. So hello, Big Ten-ACC Challenge! Among the longest running early season events, the Big Ten-ACC Challenge has gotten even juicier as both conferences beefed up their membership groups. The newbies have been more than welcome to join, like Syracuse, Pitt, Maryland, Notre Dame and Louisville. Every member of the Big Ten will square off with an ACC school (with only my alma mater, Boston College, sitting out the event…sigh). There are plenty of good games, but four great ones. (All rankings set to change when a new poll drops today). If you’re Wisconsin, you don’t love having to play the vaunted Syracuse zone defense, but you definitely don’t feel great with your two most experienced and prolific scorers, Bronson Koenig and Nigel Hayes, shooting a combined 26 percent from beyond the arc. YIKES. The Badgers have been paced by sophomore Ethan Happ, who has been all over the glass early on this season. He’s averaging 8.8 boards per game, in 25.3 minutes. If Wisconsin wins this one on the road, it will be because Happ did damage in the center of the zone and grabbed 6-8 offensive rebounds. The first couple weeks of the season for Sparty have been…not ideal. They’ve stumbled to a 3-3 record, struggling to adapt to life after Denzel Valentine. Miles Bridges has been great, as the highest ranked recruit to arrive in East Lansing in years. 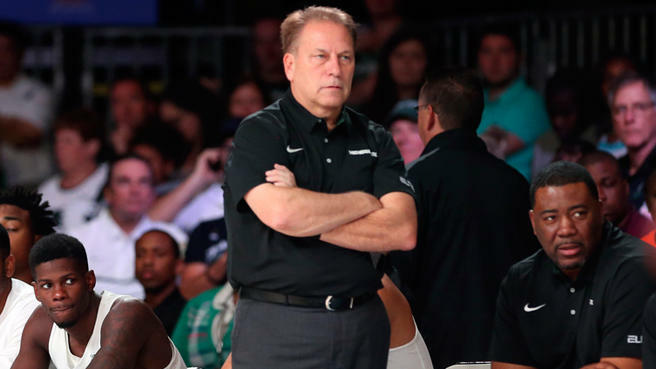 Freshman guards Joshua Langford and Cassius Winston have been spark plugs for Tom Izzo’s club, while mainstays like Lourawls Nairn and Eron Harris have been sloppy, uninspiring, or both. Freshman energy is fun, and the Spartans have needed it, but if there’s a game that requires your vets to step up, it’s when you play Duke at Cameron. Duke, meanwhile, has played well despite injuries to its entire recruiting class. Super-freshmen Jayson Tatum, Harry Giles, and Marques Bolden have played a combined zero minutes so far due to injuries. Grayson Allen has also been banged up, as has center Chase Jeter. To date, Coach K’s team has been more like the Black and Blue Devils. Yes, I wrote and published that sentence. A fun clash of styles. Pitino’s Cardinals love to run and gun. The Boilermakers are big, strong, and slow. Despite their up-tempo, pressure style, Louisville does have the size to bang with Purdue bigs Caleb Swanigan and Isaac Haas. Yet if Purdue’s guards can handle the pressure, will Louisville’s size be in the right position to stop the Boilers inside? Purdue’s ability to move the ball and find open looks will be paramount in this one. Just knowing the players and coaches involved in this one, I fully expect a wild, back-and-forth game. Putting it in Assembly Hall right after Indiana lost to Fort Wayne is like greasing up the wheels before a NASCAR race. There are a handful of players capable of earning “household name” status with a huge performance (Thomas Bryant, OG Anunoby, Justin Jackson, Joel Berry, Kennedy Meeks) and two coaches capable of blowing an early season game with questionable moves down the stretch. The zebras could be key in this one. Foul trouble for either team could be death or Thomas Bryant or Kennedy Meeks could hit the charity stripe up to twenty times. If the refs let them play, this one could be a bare-knuckle brawl. I think we’d all be just fine with seeing how each of these teams would handle a game like that this early. Wendell Carter Jr. had a very interesting recruiting period. Most people who have Duke and Georgia Tech in their final three choices are also considering other basketball powerhouses. Not true of Carter. His third finalist was Harvard. His parents wore Harvard gear to his games and openly rooted for their son to chose to join the Crimson. If you ask me, he was just trying to outdo the recent committment video from football star Greg Rogers. Palestra Back this week: How important was Indiana’s loss at Fort Wayne last week? I scribbled a few hundred words about it. Paul Flannery’s Kawhi Leonard column was excellent. The Spurs are the most interesting boring thing in the world. Tempting to pick one of the highlight games from the ACC-Big Ten Challenge, but I’ll pass and advise you to take advantage of this mid-afternoon tip and see the two best teams out West square up. They’ve played a home-and-home the last two years, resulting in instant classics each time. This year they head to a neutral site with high expectations. 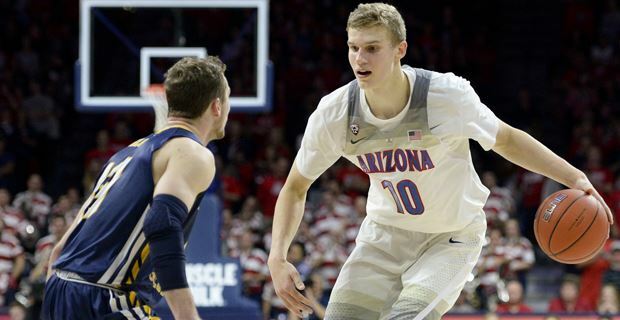 Look for how Arizona freshman big man Lauri Markkanen handles the excellent rotation of bigs in Mark Few’s arsenal.